Having headaches in figuring out the perfect recipe for your friends and family? 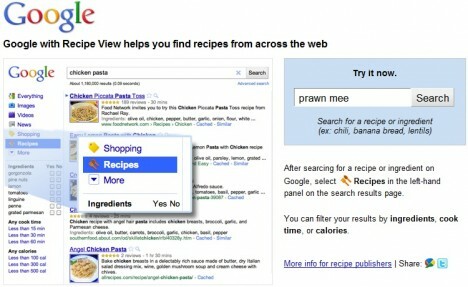 Google is introducing Recipe View – the new and convenient way to look up the recipes that match your requirements. Technically, Recipe View is a new search filter type based on the rich snippets markup that consists of Microdata, Microformats and Resource Description Framework attributes (RDFa). 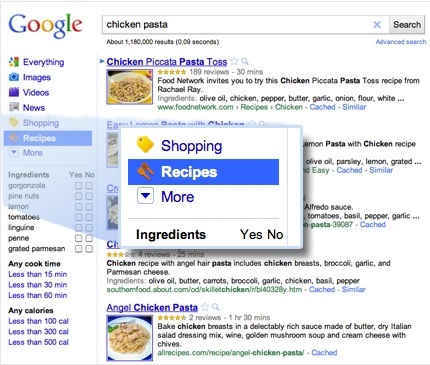 You can further “slice and dice” the search results to pinpoint the delicious food recipes that you are craving for. For instance, you could specify chicken from the Ingredients column to show only the recipes with chicken. Note that the ingredient list is generated dynamically based on the search keywords. The recipes can be filtered based on the estimated cooking time to look for the food that can be prepared within 15, 30 or 60 minutes. Allow those who are sensitive about the food calorie to search for lighter recipes by selecting the appropriate calorie amount. For the users from the U.S. and Japan, you could start the food ideas search by entering the search keywords into Google and click at the “Recipes” on the left to narrow down the search results to the food recipes only. For example, just enter tomatoes into the search box and the Recipes link retrieves all recipes that have tomatoes in the ingredients. As for the users outside from U.S. and Japan, Recipe View is also available within a few mouse clicks by visiting the direct link to Recipe View. The aforementioned features are also available for you once you hit the search button from the Recipe View page. Start drooling by searching “prawn mee” in Recipe View.